This was a cruise of “firsts” for us: First time cruising the Panama Canal, first time booking a stateroom guarantee, the first time flying in on embarkation day, and first time doing Silent Disco. It was a very good cruise but the Infinity is showing her age and so are the majority of passengers on this cruise (which we expected since not many working people can take 15 days vacation at one time). I estimate the average age at 75. There was a total of 3 children onboard. My wife and I regularly sail Celebrity and booked this cruise 6 weeks in advance since they had a great veranda guarantee rate. 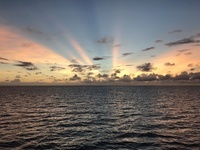 We were hesitant to book a guarantee and had never done so before because stateroom location is important to us. After reading about others having positive experiences booking guarantee we decided to give it a try. Within a week after booking we were assigned stateroom 7122, a mid-ship class 2A veranda, which is what we normally try to book. The Ship: The Infinity is an upscale ship but she is getting old with her décor becoming somewhat outdated. All public areas are well maintained. There was a funny, sewage-like, smell in a few areas of the ship. The most noticeable was in the photo gallery. The Martini bar’s ice top isn’t working properly and there are many bare, wet areas on the bar top. The public restrooms do not have automatic openers like the Solstice class ships and they are small. Celebrity no longer has attendants in restrooms at all times during the busy evening hours. The loungers around the pool seem new but they do not have pads and there is a crossbar just below your rear-end when sitting and is uncomfortable. 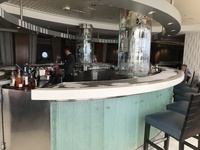 The Sunset bar is very nice but the bar stools are worn and most no longer rotate making it uncomfortable if you want to turn and watch the latest port fade into the distance. Crew: Were very good. Stateroom attendant was efficient and friendly as were the wait staff in the MDR. For the most part, bartenders and lounge service was very good. Embarkation: We flew into San Diego the morning of embarkation. Thankfully, our flight was on time. We took an Uber to the pier, which only takes about 6-8 minutes, and arrived at about 11:00 AM. There were plenty of porters to help with luggage. The lines to check in were short so we were checked in and ready to board by 11:15 AM. This was the first time we didn’t need to fill out a health questionnaire before boarding (they probably should have since there was a lot of illness on this cruise but more on that later). The ship wasn’t ready for new passengers so we were given a group number and had to wait about 20 minutes before we could board. That gave us time to start making new friends. The stateroom: Is a standard veranda and has easy access to mid-ship stairs and elevators. It was clean, the bed was comfortable and overall in good shape but looking outdated. There is plenty of storage in the closets, in the night stands (which have 2 drawers each and much better than Solstice class night stands) and under the bed. There is a small loveseat and table but in order to more easily move around we push the table against the loveseat making it unusable most of the time. There is a small desk that doubles as a dressing table which has two small storage areas. The standard pillows are foam so we asked the stateroom attendant for feather pillows and he quickly obtained them for us. Carpet was in good shape and there is a wall of mirrors across from the bed. The TV is small and – to our dismay they do not offer a variety of music choices through the TV entertainment system. We enjoy playing music while we get ready for the evening. If you do too then I recommend bringing a small Bluetooth speaker and listen to the music from your smartphone. The drape covering the veranda door is NOT blackout. The room will get light as soon as the sun comes up, which was 5:45 AM on some of our days. The air conditioning worked OK but we could not get the room cold enough for us to sleep comfortably. It would go down to about 70 F but on other ships it will regularly go down to 66-68 F at night. There were some guests down the hall from us that slept with their veranda door open (evidenced by the hot, humid air blowing out from under their doors) which may have contributed to the A/C issue. CAUTION there is a crew door across the hall from #7122 and it makes a loud noise when it shuts, if the crew doesn’t ease it closed. We were awakened before 7 by this slamming door on a few mornings. The bathroom: Is standard size for Celebrity. It has two corner storage shelves above the counter and storage under the sink. The sink is relatively large and deep compared to the vessel sinks on Solstice class ships. The shower runs the width of the bathroom rather than be in the corner like on Solstice class. It has a curtain rather than shower door. I prefer the shower setup on Solstice class ships. Unfortunately, the bathroom had seen better days. The tile on the floor is discolored and some tiles were loose. There is a lot of bad caulking in the shower with black mold growth. The toilet has a permanent black ring. Also, there isn’t an outlet for electric shavers. The veranda: Is small but adequate for 2 people. It has two chairs (which do not recline) and a short table. Deck 8 above extends further out so you are well protected from rain if it isn’t too windy. Illness: It seemed like most people on board were coughing and sneezing. Unfortunately, most were doing so into their hands rather than into their elbow or shoulder. Even though Celebrity actively promotes washing of hands and using hand sanitizer I witnessed many men not washing after using the restroom and others not using the hand sanitizer offered by staff. We always bring hand sanitizer with and use it after touching anything in the restaurants, handrails, etc. Halfway through the cruise an announcement was made that they were stepping up sanitizing precautions. Crew began serving at most stations in Oceanview and there was a noticeable increase in crew wiping down railings, table, door knobs, etc. SURPRISE! I came down with a cold the day I arrived home. Coincidence? Entertainment: The production shows were entertaining. Even though we sail with Celebrity often there was only one show we had seen before. Live music was hit and miss. There was a string duo, a solo guitarist/singer and a duo guitarist and singer that were very good. There was a pianist/singer that played beautiful but he is not a good singer. The house band was pretty good as well as a dance band that played in Rendez-Vous lounge. It was disappointing that there wasn’t any live music from 6-6:30. If you dine late, like to go to the 7 PM show and want a cocktail at 6 then you will have to enjoy it in silence or with canned background music. The guest entertainers were a mixed bag. Comedian, Al Duchame, and impressionist/singer, Sean O’Shea, were excellent. Some of the entertainers spend too much time talking between numbers and should just keep on singing or playing. DJ Miguel did a great job and is very friendly. We participated in Silent Disco twice in Constellation lounge. We never did it before because when you only watch it seems weird. Well, if you haven’t tried it you should. It was a lot of fun choosing between three different types of music on the headphones and dancing with my wife and others we met on the dance floor. The Wedding game, Risky Feud, Liars Club, Gender battle were hit or miss depending on the people selected to participate. They also did an Abba show with the production cast which was fun but very crowded. The Cruise Director was Luigi, Activities Manager was Bethany and Activity staff Gina and Chiko – all did a great job. Food and Restaurants: Overall, food was very good. Oceanview: Quality is hit-or-miss. The layout is “racetrack” style vs the open style of Solstice ships. This was better for traffic flow. Tip. Most people stop at the first food stations when they enter. There are more stations toward the back so head there first or enter from the rear staircase and you may be away from the crowds. Seating can be difficult during peak times. MDR: Was very good for breakfast, lunch and dinner. They severed Mahi-Mahi at lunch one day and it was THE BEST meal my wife and I have ever had on a cruise. This was a surprise since often fish is overdone on cruises. We did have some problems at breakfast with getting my omelet order correct. Prime rib was served twice and was delicious. Most salads were also very good. Desserts are just OK. There are a good variety of choices on the menu. Tuscan: When we dined there were only 6 other tables with diners. We were able to have a leisurely 3.5-hour dinner. The filet mignon was excellent. The goat cheese arugula salad and charcuterie plan were very good too. Celebrity often will give discounts to try to fill the specialty restaurants. Don’t pre-book but look for restaurant staff trolling Martini bar and outside Oceanview offering discounts. We got 50% off. Café al Bacio: Coffee always good and usually efficient service. The layout doesn’t lend to natural formation of a queue so you need to watch out for people walking up ahead of those already waiting. Pastries in the morning and desserts during the day are pretty good. Gelato is across the way and is very good. The Panama Canal: During the cruise a guest speaker, Bill Fall, provided multiple presentations on the history and building of the canal. He is excellent. If you are interested in history and the mechanics of ships traversing the locks then you will really enjoy the canal. If you don’t then it may be a boring day. We traveled north from the Pacific to the Atlantic. Celebrity had the helipad open all day and many people go there or to deck 11/12 at the bow. If you are traveling as a couple or with friends then I suggest one person stay up front and another go to aft to deck 10 or 12. The views back toward the Pacific as you go under bridges and through the locks are less industrial and very few fellow passengers go aft. Once in the locks go to deck 4 outside on the side toward the middle wall between the 2 locks. This gives a great view of the activity on the locks and has a great perspective of the ship being raised and lowered. If you have family back at home they can watch the ship transit the locks on pancanal.com. Click the “multimedia” tab at the top and select the webcam to view. Ports: Cabo San Lucas: This is a tender and the tender process took a long time. We tried to get off before our Celebrity excursion but because of the delay we stayed on board until meeting for the excursion. The city area by the pier is clean and no aggressive souvenir sellers. We did a boat trip to Lands’ End and scenic stop tour (CS01). The tour group was relatively large but so was the boat so it did not feel crowded. Watch for seals begging for bait from the fishing boats going into the harbor. There is a 15-minute bus ride to the lookout. The lookout is at a hotel and gives a nice view of the ocean and looking back to Cabo. They serve a beer or soft drink that is included in the price. Puerto Vallarta: Nice city. We felt safe in all the areas we visited. We took an Uber from port to the Malecon area. Cost is $3 total each way vs the $2-4 per person taxi charges. We did a bike ride excursion around the Malecon area with Xiulta Riders that was arranged by another couple. It was a lot of fun but some of their bikes are older and only single speed. JC was our guide and is a friendly young man that speaks English well. 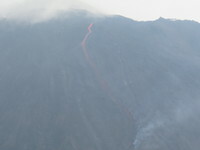 Puerto Quetzal: We hiked the Pacaya volcano on an excursion through Celebrity (GQ61). This is an active volcano and the highlight was seeing lava flowing from the summit. There were breathtaking views of the Guatemala countryside. Bus ride from port was about 1.5 hours. There isn’t much to do in port and it is a long drive to get to other cities that have shopping or activities. Puntarenas: We arranged the 10-in-1 tour with ThumbsUp Tours. They do a very good job. Highlights included seeing crocs, toucans, monkeys, leaf-cutter ants and beautiful views. We felt safe in port and there weren’t any aggressive souvenir sellers. 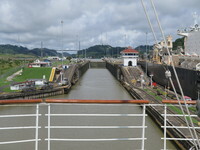 Colon: We joined a tour of Fort San Lorenzo and the Agua Clara locks of the Panama Canal. Roberto was our tour guide. The fort is interesting but a long drive from Colon and no restrooms on site. We saw howler monkeys as we were leaving which was very interesting. The locks are interesting but after having traveled the locks the previous day most of what we saw was repetitive. While the port area is safe the city of Colon itself is not. It is very run down and crowded. Cartagena: This is a beautiful city. The port area is safe and has a small bird exhibit. We arranged a city tour with Dora. Highlights were the monastery at La Popa, which has a spectacular lookout over the city, and a walking tour of Old Town. The colonial architecture is wonderful. There are many souvenir sellers everywhere and some are fairly aggressive. It is VERY humid here so take it slow and have plenty of water if you aren’t used to it. Overall, the cruise was very good. Celebrity does a nice job and the itinerary is great. This was a cruise of “firsts” for us: First time cruising the Panama Canal, first time booking a stateroom guarantee, the first time flying in on embarkation day, and first time doing Silent Disco. It was a very good cruise but the Infinity is showing her age and so are the majority of passengers on this cruise (which we expected since not many working people can take 15 days vacation at one time). I estimate the average age at 75. There was a total of 3 children onboard. My wife and I regularly sail Celebrity and booked this cruise 6 weeks in advance since they had a great veranda guarantee rate. 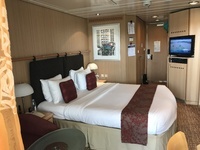 We were hesitant to book a guarantee and had never done so before because stateroom location is important to us. After reading about others having positive experiences booking guarantee we decided to give it a try. Within a week after booking we were assigned stateroom 7122, a mid-ship class 2A veranda, which is what we normally try to book. The Ship: The Infinity is an upscale ship but she is getting old with her décor becoming somewhat outdated. All public areas are well maintained. There was a funny, sewage-like, smell in a few areas of the ship. The most noticeable was in the photo gallery. The Martini bar’s ice top isn’t working properly and there are many bare, wet areas on the bar top. The public restrooms do not have automatic openers like the Solstice class ships and they are small. Celebrity no longer has attendants in restrooms at all times during the busy evening hours. The loungers around the pool seem new but they do not have pads and there is a crossbar just below your rear-end when sitting and is uncomfortable. The Sunset bar is very nice but the bar stools are worn and most no longer rotate making it uncomfortable if you want to turn and watch the latest port fade into the distance. Crew: Were very good. Stateroom attendant was efficient and friendly as were the wait staff in the MDR. For the most part, bartenders and lounge service was very good. Embarkation: We flew into San Diego the morning of embarkation. Thankfully, our flight was on time. We took an Uber to the pier, which only takes about 6-8 minutes, and arrived at about 11:00 AM. There were plenty of porters to help with luggage. The lines to check in were short so we were checked in and ready to board by 11:15 AM. This was the first time we didn’t need to fill out a health questionnaire before boarding (they probably should have since there was a lot of illness on this cruise but more on that later). The ship wasn’t ready for new passengers so we were given a group number and had to wait about 20 minutes before we could board. That gave us time to start making new friends. The stateroom: Is a standard veranda and has easy access to mid-ship stairs and elevators. It was clean, the bed was comfortable and overall in good shape but looking outdated. There is plenty of storage in the closets, in the night stands (which have 2 drawers each and much better than Solstice class night stands) and under the bed. There is a small loveseat and table but in order to more easily move around we push the table against the loveseat making it unusable most of the time. There is a small desk that doubles as a dressing table which has two small storage areas. The standard pillows are foam so we asked the stateroom attendant for feather pillows and he quickly obtained them for us. Carpet was in good shape and there is a wall of mirrors across from the bed. The TV is small and – to our dismay they do not offer a variety of music choices through the TV entertainment system. We enjoy playing music while we get ready for the evening. If you do too then I recommend bringing a small Bluetooth speaker and listen to the music from your smartphone. The drape covering the veranda door is NOT blackout. The room will get light as soon as the sun comes up, which was 5:45 AM on some of our days. The air conditioning worked OK but we could not get the room cold enough for us to sleep comfortably. It would go down to about 70 F but on other ships it will regularly go down to 66-68 F at night. There were some guests down the hall from us that slept with their veranda door open (evidenced by the hot, humid air blowing out from under their doors) which may have contributed to the A/C issue. CAUTION there is a crew door across the hall from #7122 and it makes a loud noise when it shuts, if the crew doesn’t ease it closed. We were awakened before 7 by this slamming door on a few mornings. The bathroom: Is standard size for Celebrity. It has two corner storage shelves above the counter and storage under the sink. The sink is relatively large and deep compared to the vessel sinks on Solstice class ships. The shower runs the width of the bathroom rather than be in the corner like on Solstice class. It has a curtain rather than shower door. I prefer the shower setup on Solstice class ships. Unfortunately, the bathroom had seen better days. The tile on the floor is discolored and some tiles were loose. There is a lot of bad caulking in the shower with black mold growth. The toilet has a permanent black ring. Also, there isn’t an outlet for electric shavers. The veranda: Is small but adequate for 2 people. It has two chairs (which do not recline) and a short table. Deck 8 above extends further out so you are well protected from rain if it isn’t too windy. Illness: It seemed like most people on board were coughing and sneezing. Unfortunately, most were doing so into their hands rather than into their elbow or shoulder. Even though Celebrity actively promotes washing of hands and using hand sanitizer I witnessed many men not washing after using the restroom and others not using the hand sanitizer offered by staff. We always bring hand sanitizer with and use it after touching anything in the restaurants, handrails, etc. Halfway through the cruise an announcement was made that they were stepping up sanitizing precautions. Crew began serving at most stations in Oceanview and there was a noticeable increase in crew wiping down railings, table, door knobs, etc. SURPRISE! I came down with a cold the day I arrived home. Coincidence? Entertainment: The production shows were entertaining. Even though we sail with Celebrity often there was only one show we had seen before. Live music was hit and miss. There was a string duo, a solo guitarist/singer and a duo guitarist and singer that were very good. There was a pianist/singer that played beautiful but he is not a good singer. The house band was pretty good as well as a dance band that played in Rendez-Vous lounge. It was disappointing that there wasn’t any live music from 6-6:30. If you dine late, like to go to the 7 PM show and want a cocktail at 6 then you will have to enjoy it in silence or with canned background music. The guest entertainers were a mixed bag. Comedian, Al Duchame, and impressionist/singer, Sean O’Shea, were excellent. Some of the entertainers spend too much time talking between numbers and should just keep on singing or playing. DJ Miguel did a great job and is very friendly. We participated in Silent Disco twice in Constellation lounge. We never did it before because when you only watch it seems weird. Well, if you haven’t tried it you should. It was a lot of fun choosing between three different types of music on the headphones and dancing with my wife and others we met on the dance floor. The Wedding game, Risky Feud, Liars Club, Gender battle were hit or miss depending on the people selected to participate. They also did an Abba show with the production cast which was fun but very crowded. The Cruise Director was Luigi, Activities Manager was Bethany and Activity staff Gina and Chiko – all did a great job. Food and Restaurants: Overall, food was very good. Oceanview: Quality is hit-or-miss. The layout is “racetrack” style vs the open style of Solstice ships. This was better for traffic flow. Tip. Most people stop at the first food stations when they enter. There are more stations toward the back so head there first or enter from the rear staircase and you may be away from the crowds. Seating can be difficult during peak times. MDR: Was very good for breakfast, lunch and dinner. They severed Mahi-Mahi at lunch one day and it was THE BEST meal my wife and I have ever had on a cruise. This was a surprise since often fish is overdone on cruises. We did have some problems at breakfast with getting my omelet order correct. Prime rib was served twice and was delicious. Most salads were also very good. Desserts are just OK. There are a good variety of choices on the menu. Tuscan: When we dined there were only 6 other tables with diners. We were able to have a leisurely 3.5-hour dinner. The filet mignon was excellent. The goat cheese arugula salad and charcuterie plan were very good too. Celebrity often will give discounts to try to fill the specialty restaurants. Don’t pre-book but look for restaurant staff trolling Martini bar and outside Oceanview offering discounts. We got 50% off. Café al Bacio: Coffee always good and usually efficient service. The layout doesn’t lend to natural formation of a queue so you need to watch out for people walking up ahead of those already waiting. Pastries in the morning and desserts during the day are pretty good. Gelato is across the way and is very good. The Panama Canal: During the cruise a guest speaker, Bill Fall, provided multiple presentations on the history and building of the canal. He is excellent. If you are interested in history and the mechanics of ships traversing the locks then you will really enjoy the canal. If you don’t then it may be a boring day. We traveled north from the Pacific to the Atlantic. Celebrity had the helipad open all day and many people go there or to deck 11/12 at the bow. If you are traveling as a couple or with friends then I suggest one person stay up front and another go to aft to deck 10 or 12. The views back toward the Pacific as you go under bridges and through the locks are less industrial and very few fellow passengers go aft. Once in the locks go to deck 4 outside on the side toward the middle wall between the 2 locks. This gives a great view of the activity on the locks and has a great perspective of the ship being raised and lowered. If you have family back at home they can watch the ship transit the locks on pancanal.com. Click the “multimedia” tab at the top and select the webcam to view. 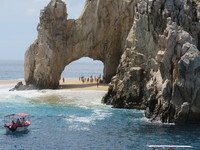 Cabo San Lucas: This is a tender and the tender process took a long time. We tried to get off before our Celebrity excursion but because of the delay we stayed on board until meeting for the excursion. The city area by the pier is clean and no aggressive souvenir sellers. We did a boat trip to Lands’ End and scenic stop tour (CS01). The tour group was relatively large but so was the boat so it did not feel crowded. Watch for seals begging for bait from the fishing boats going into the harbor. There is a 15-minute bus ride to the lookout. The lookout is at a hotel and gives a nice view of the ocean and looking back to Cabo. They serve a beer or soft drink that is included in the price. Puerto Vallarta: Nice city. We felt safe in all the areas we visited. We took an Uber from port to the Malecon area. Cost is $3 total each way vs the $2-4 per person taxi charges. We did a bike ride excursion around the Malecon area with Xiulta Riders that was arranged by another couple. It was a lot of fun but some of their bikes are older and only single speed. JC was our guide and is a friendly young man that speaks English well. Puerto Quetzal: We hiked the Pacaya volcano on an excursion through Celebrity (GQ61). This is an active volcano and the highlight was seeing lava flowing from the summit. There were breathtaking views of the Guatemala countryside. Bus ride from port was about 1.5 hours. There isn’t much to do in port and it is a long drive to get to other cities that have shopping or activities. Puntarenas: We arranged the 10-in-1 tour with ThumbsUp Tours. They do a very good job. Highlights included seeing crocs, toucans, monkeys, leaf-cutter ants and beautiful views. We felt safe in port and there weren’t any aggressive souvenir sellers. Colon: We joined a tour of Fort San Lorenzo and the Agua Clara locks of the Panama Canal. Roberto was our tour guide. The fort is interesting but a long drive from Colon and no restrooms on site. We saw howler monkeys as we were leaving which was very interesting. The locks are interesting but after having traveled the locks the previous day most of what we saw was repetitive. While the port area is safe the city of Colon itself is not. It is very run down and crowded. Cartagena: This is a beautiful city. The port area is safe and has a small bird exhibit. We arranged a city tour with Dora. Highlights were the monastery at La Popa, which has a spectacular lookout over the city, and a walking tour of Old Town. The colonial architecture is wonderful. There are many souvenir sellers everywhere and some are fairly aggressive. It is VERY humid here so take it slow and have plenty of water if you aren’t used to it. Overall, the cruise was very good. Celebrity does a nice job and the itinerary is great. This is a beautiful city. The port area is safe and has a small bird exhibit. We arranged a city tour with Dora. Highlights were the monastery at La Popa, which has a spectacular lookout over the city, and a walking tour of Old Town. The colonial architecture is wonderful. There are many souvenir sellers everywhere and some are fairly aggressive. It is VERY humid here so take it slow and have plenty of water if you aren’t used to it. Roberto was our tour guide. The fort is interesting but a long drive from Colon and no restrooms on site. We saw howler monkeys as we were leaving which was very interesting. The locks are interesting but after having traveled the locks the previous day most of what we saw was repetitive. While the port area is safe the city of Colon itself is not. It is very run down and crowded. We hiked the Pacaya volcano on an excursion through Celebrity (GQ61). This is an active volcano and the highlight was seeing lava flowing from the summit. There were breathtaking views of the Guatemala countryside. Bus ride from port was about 1.5 hours. There isn’t much to do in port and it is a long drive to get to other cities that have shopping or activities. We did a bike ride excursion around the Malecon area with Xiulta Riders that was arranged by another couple. It was a lot of fun but some of their bikes are older and only single speed. JC was our guide and is a friendly young man that speaks English well. They do a very good job. 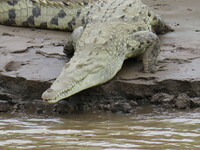 Highlights included seeing crocs, toucans, monkeys, leaf-cutter ants and beautiful views. We felt safe in port and there weren’t any aggressive souvenir sellers.